EcosAgile's coverage of a wide range of functions, represents a strength which very few other products can compare with. The pre-configured functions and available for virtually immediate use and always allow the client to implementcustomizations and adaptations(stored natively on the platform and retained across release updates). The client's data is always protected and can be loaded directly by the user using simple xls files (especially if the client has other archives and/or other software to be replaced); data can always just as easily be downloaded directly by the user, for analysis, export and/or communications. The various functions follow a modular logic and can be used together or individually, and these settings can be changed at a later date without project constraints. Clients are free to choose activation strategies according to their own priorities: it is not, for example, necessary to begin with the Workforce personnel data module before proceeding with Development and/or Selection. 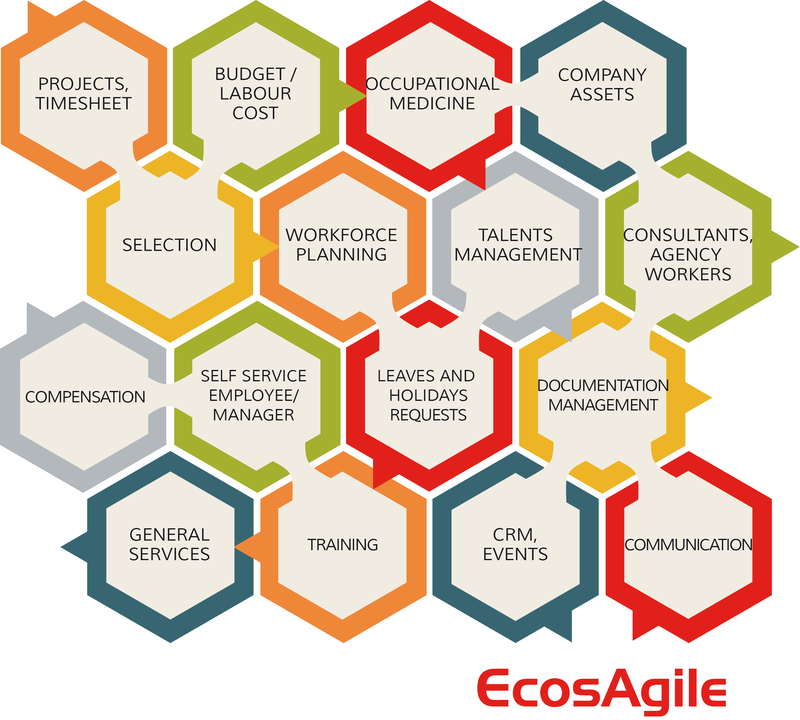 EcosAgile can be linked to existing ERP or HR systems, thus operating as a complementary system for specific processes and/or modules of interest. EcosAgile provides integration management functions that support the importing and exporting of data into chosen formats and structures in a matter of minutes! Each module facilitates the configuration of the desired Workflows, with reporting, analytics, timetables and notifications immediately available for selection and which are easily changeable and extendible. Motor vehicles / telephones / SIMs / internet keys etc.